Without a guide, how is one to get from the city of destruction to the celestial city? During the Middle Ages pilgrims traveled on foot (or hoof). In John Bunyan's work, Christian conversed with Apollyon, out of whose "belly came fire and smoke," and whose look conveyed disdain. But his intermittent guide was The Evangelist. Modern characters traveled by comet or a train, and what about drones for post-modern transport? Below are some inklings of how one might be guided afoot, but first some variations on the theme of transport. Nathaniel Hawthorne used the template of John Bunyan's footsore progress to send himself comfortably toward his own celestial destination on the railroad. He wrote, "The engine looked more like a sort of mechanical demon that would hurry us to the infernal regions than a laudable contrivance for smoothing our way to the Celestial City." (Hawthorne, The Celestial Railroad.) The engineer of Hawthorne's train is apparently Apollyon, who kept the Castle of Destruction in Bunyan's The Pilgrim's Progress From This World To That Which Is To Come. "In less than ten seconds that comet was just a blazing cloud of red-hot canvas. It was piled up into the heavens clean out of sight—the old thing seemed to swell out and occupy all space; the sulphur smoke from the furnaces—oh … nobody can half describe the way it smelt. …The captain of the comet had been rousted out, and he stood there in the red glare for’ard, by the mate, in his shirt-sleeves and slippers, his hair all rats’ nests and one suspender hanging, and how sick those two men did look!" Twain's story carries the type of "backwoods fantastic" fairly even-handedly, balancing it with the comet-like steamship's 19th C. applied science. In C.S. 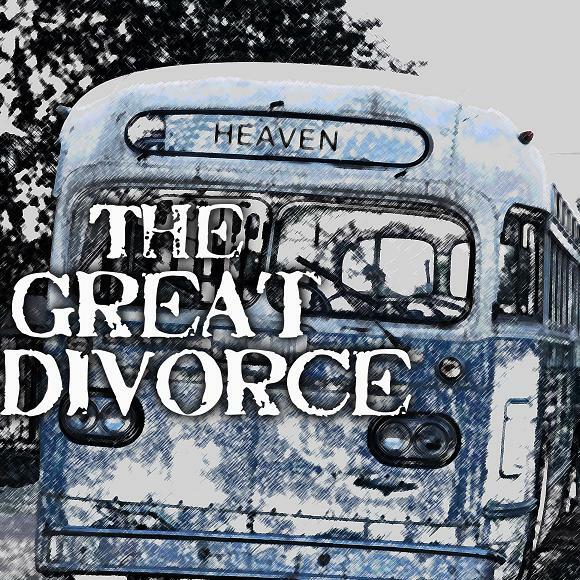 Lewis's The Great Divorce conveyance from hell to heaven is a flying bus. The features of its driver, though filled with light, are a far cry from those of Apollyon. Lewis, the traveller, saw in this driver's face only competence, authority, and the intension to do his job. He is one of Lewis's "solid people" doing the work they've got to do. 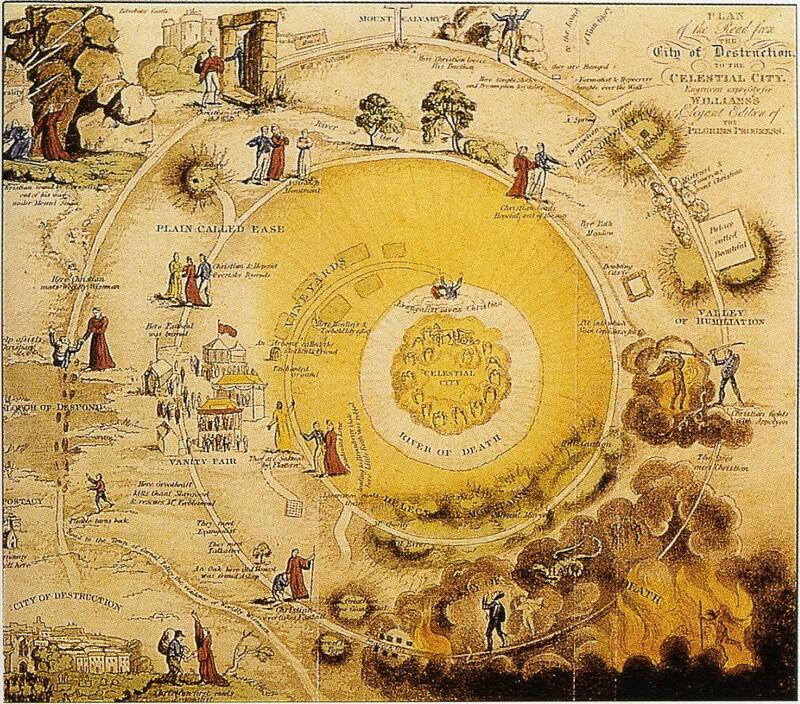 The bus and driver come from heaven itself, not the infernal regions suggested by Hawthorne's engineer. In his railway carriage, Hawthorne had seated himself comfortably with Mr. Smooth-it-away for a quasi-guide. But Lewis was jostled by passengers fancying arrogance on the part of the driver while complaining that his steady competent look was offensive and unnatural. These engines of transport suggest a progression, yet the personal is highly evident in this progress. Will some near-future literary journey go a-droning? No doubt some creative soul might fabricate such a journey. Would anything be lost in the adventure, if so? The person as pilot is important to me, so it must be an artificially intelligent drone. Not far off-topic—remember the robass in"The Quest For Saint Aquin" by Anthony Boucher? This artificially intelligent donkey was equipped with both wheels and hooves to aid over various terrains. In the late 1600s, our first pilgrim began his journey to "The Celestial City" under his own power, on his two feet. Being told as a dream, Bunyan's tale of Christian is, as Hawthorne's story, an allegory, a morality tale with allegorical names. Here now are two Inklings' accounts of footsore travelers moving through hellish landscapes toward a celestial destination. In these examples I usurp two stories as allegory for my theme of guides from the underworld towards an eventual celestial destination. In CS Lewis's The Silver Chair, Puddleglum is the literal footsore hero, a good guide through Overworld for two children who've been assigned by The Lordly Aslan to find Prince Rilian. Puddleglum leads the way and gives advice (albeit with negative commentary), and also becomes a saving figure in sacrificing a bit of his flesh to mesmerizing fire. However, in The Underworld they are guided by another. They've fallen under the earth, there encountering one of the lugubrious earthmen who commands them to journey with him, and come before the queen of the underworld. This journey through the underworld is dark with strange objects and living, sleeping things, including the gigantic Father Time. Clearly their guide is deeply melancholy, and the populace, through which they make their way, are all very unhappy. 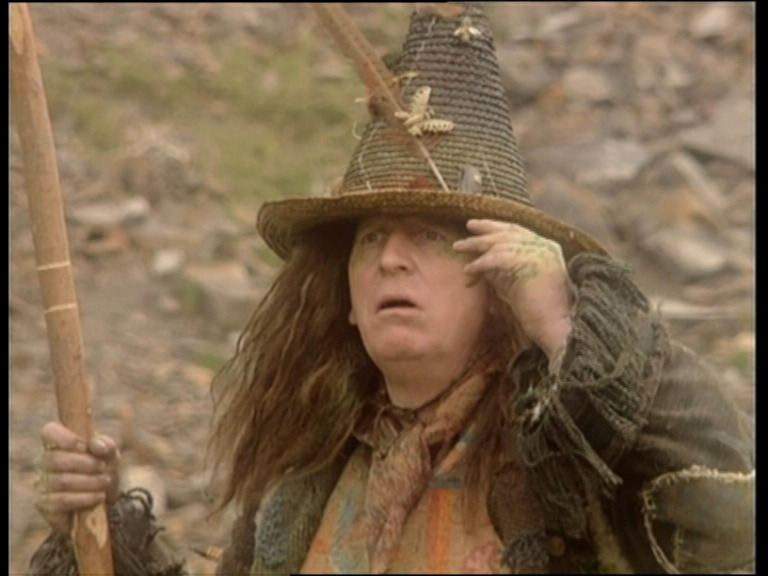 One of the guided children, Jill Pole, wishes she could cheer the inhabitants, and with her friend Eustace and Puddleglum's help, guards against becoming hysterical or unhappy herself. The underworld queen and these experiences echo the narrative of H. Rider Haggard's novel SHE as its heroes travel to meet her inside the mountainous earth—She, the Queen who must be obeyed. CSL's lugubrious guide is under the enchantment of the underworld queen, along with all the realm, and cannot believe in the good of anything—because her will is not to be questioned. Once their mission is complete Puddleglum and the children emerge with the Prince into Narnia in time to witness the passing in death of King Caspian the Seafarer. Caspian had always wanted to go to the end of the world, to Aslan's Country, but had to oversee the kingdom of Narnia instead. Jill and Eustace are so sad seeing him die that they wish to be home in our world again. But joyfully, in this allegory of traveling to the celestial realm, they find him alive again in the Country of Aslan. There's another Inklings' story dealing with guidance that is worth considering. I had considered using JRRT's story of Beren and Lúthien's journey because the pair must go through Angband, the underworld of the First Age. Their journey ended in the beautiful afterlife haven of Mandos before their return to life in Middle-earth. Though Huan was with them, still this episode had no guide. The best hell-land guide in a Tolkien story, I find, is the one in which Gollum guides Frodo and Sam through hellish Mordor, beginning on its outskirts. This pathetic, small and malicious guide, along with their horrendous journey, are so familiar to Tolkien readers that I will not recount it here. The demented Gollum has great stamina, is largely unheroic but not wholly so. Gollum's hysterical inadvertent culminating success as guide saves him from his torturing obsession, and transforms the journey for his travelers. They are found worthy to transcend Middle-earth in a vessel powered by the Winds of Manwë, gaining life in the (Celestial) West and healing from all hurts of Middle-earth and hell (Mordor). CS Lewis provides us with the most heroic guides in this thematic grouping. One is simply going about his business in a competent and conscientious manner; the other, though negative and depressing, is nonetheless of the heroic and sacrificial type. But in all these tales, the heroes are those who make the journey. "Once their mission is complete Puddleglum and the children emerge with the Prince into Narnia in time to witness the passing in death of King Caspian the Seafarer." Apparently I'm mis-remembering.... My memory says it was not at the end of their quest that Jill and Eustace saw Caspian's funernal, but at the beginning: their friend Caspian was gone, and his deaf official who knew not Joseph, refused cooperation to 'Useless'. In TGD, your description of the passengers' reaction to the bus driver sounded like something out of Atlas Shrugged. ;-) I think there was more to the bus driver than that. His mysterious gesture of waving something away from his face turned up in a Charles Williams thriller too, and had something to do with Dante...? Anyway, in TGD the bus driver had little to say; the narrator/guide role was MacDonald's. Where did Virgil do that (for Dante?) according to Williams. From a non-Inklings source, see Myers' Golias in Silverlock. I thought of Virgil and Dante, too. Passing your comments onto the author of the article!